Imam Dr Abduljalil Sajid reported to the small group of the recent UPF consultation in Amaan, Jordan. Imam Sajid explained that there were 150 participants present at different times of the consultation representing many of the involved parties in the conflict. He said on the whole all participants were not trying to take sides but earnestly searching for a solution. 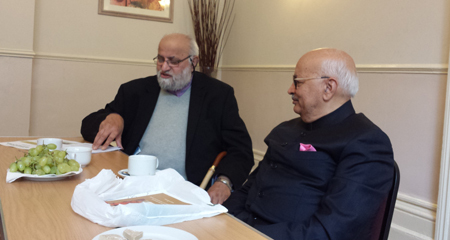 Imam Sajid said, 'I think UPF is doing a marvellous job bringing a diverse group together for the sake of God. Twenty seven nationalities came together to discuss the difficult issues involved.' The consultation conference had all concurred that they should be able to be reconvene as a Track II diplomatic effort in Geneva during the Syrian peace negotiations. He spoke passionately about the refugees from the Syrian conflict who are in a very difficult situation now but it will be much more serious during the winter. Some of the conference participants went to see the refugee camps. The report on the consultation is available here. The communique from the consultation is available here. HE Prasad Singh suggested that UPF could encourage the Jordanian Government to outline what is needed to care for the refugees so that the international community can respond as best as it can. Jordan is responsible for those residing within their borders. Refugees are subject to the laws of Jordan. Imam Sajid explained that Mr Hamdi Murad, the UPF leader in Jordan, would be working on this issue. David Fairbank, an engineer and inventor, explained the motivation behind a project to develop low cost housing capacity. He traced the history of the project that was revived through his involvement with UPF. To a certain extent the UPF's Ambassador for Peace network had facilitated the development of this project. He passionately described the need for low cost and reasonable quality housing that will last for more than a generation. Robin Marsh placed this project within the context of a rural to urban shift in large areas of the world that has resulted in many slums when cities were unable to cope with the influx. Mark Brann, the European Secretary General of UPF, outlined the work of UPF in Europe. He highlighted the North Korean medical project that is a European UPF- International Relief Friendship Foundation effort, supporting a children's hospital in Pyongyang.